Timber belonging to Triplegrove. 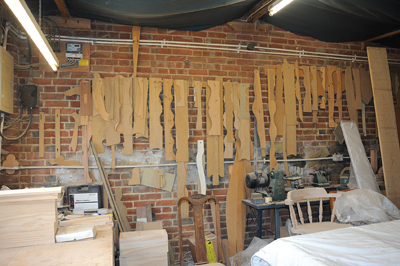 If there are offcuts left over, they will go in the woodburner to heat the shop! A selection of treasure chests ready to go. 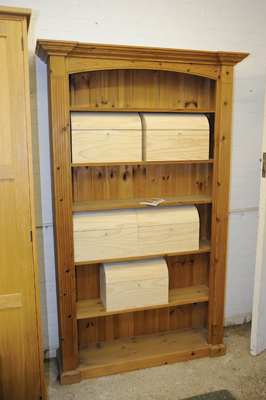 And a bookcase we would all like to own! 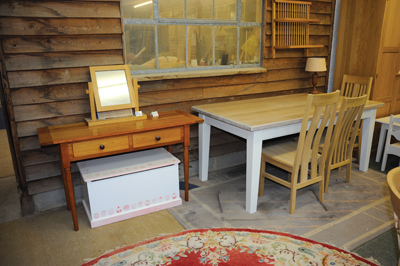 Arriving on a busy day, like any other, at Triplegrove Furniture's workshop, we were greeted by the smell of a round tabletop being sprayed with a semi-matt lacquer outside. Founded and run by time-served engineers Mike James and Graham Harrison, Triplegrove has steadily expanded its site on the 3,500 acre Knepp Castle Estate in West Sussex over the last 24 years. Their secret is simple: smart, economical practice, and a high standard of craftsmanship that keeps the commissions coming in. The bulk of Triplegrove's custom comes from two very different sources. Dragons of Walton Street, Knightsbridge, make high-end, hand-painted children's furniture, with decoration including familiar scenes from the illustrations of Beatrix Potter's tales, which Dragons has exclusive licence to use on furniture. 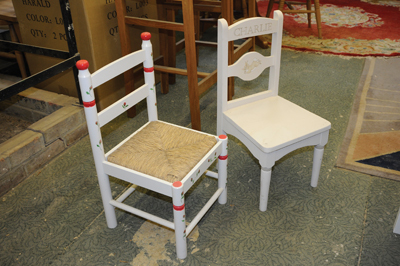 Triplegrove are commissioned to make the furniture and apply the base coat of paint, making scaled-down chairs, tables, chests of drawers, beds and whatever else the customers want for their little treasures. Triplegrove's other regular client is New England Home Interiors, a bespoke British furniture design company with a retail outlet in nearby Horsham. They supply Triplegrove with the designs to make their sophisticated, ornate pieces. 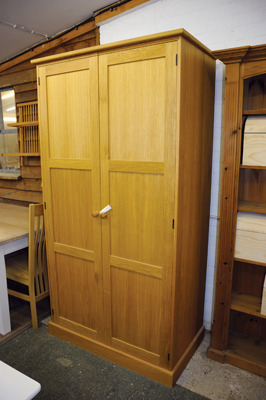 Triplegrove also offer bespoke furniture direct to customers as well as fitting kitchens. "Dragons used to buy their chairs in from another company based in Spain," partner Mike James tells me, "but they ended up getting half of them returned!" Dragons asked if Triplegrove could make one, and satisfied with the result, put in the order for 1,000; they've used Triplegrove ever since. 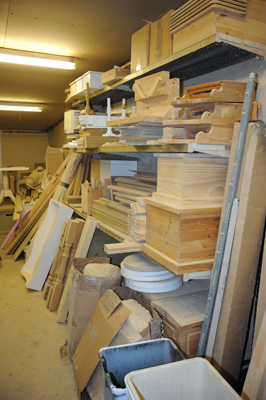 "Touch wood," Says Mike, and there's a lot of it to pick from, "we've hardly ever had a piece sent back for repair." Triplegrove has made some 8,000 chairs for Dragons so far. With a full-time workforce of just four, you might wonder how a company produces high-quality furniture in such volume. 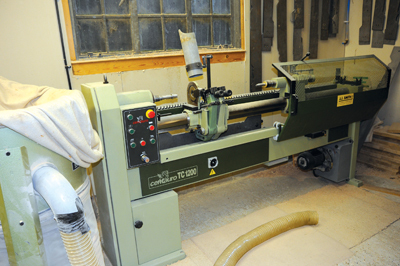 Perhaps the most time-saving piece of kit in the workshop is the Centauro TC 1200 hydraulic copy lathe. 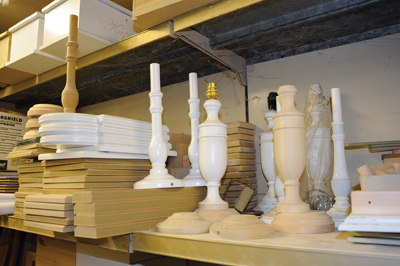 A laser traces a mould - dozens of which hang on the walls - in turn guiding a pre-cut tool, roughing tool and finishing tool to create identical turned components, from chair legs - which take about 80 seconds each from start to finish - to lamps. 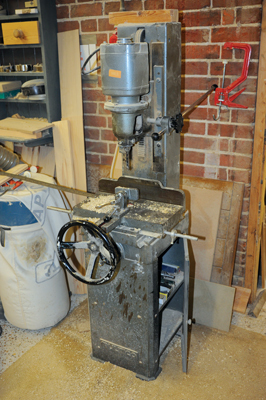 "It's economical to use the copy lathe even for a small run of four pieces," says Mike. 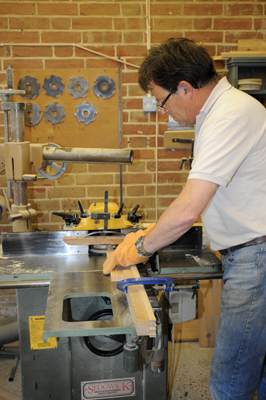 The holes for the leg braces are made using a Sealey pillar drill, with simple shop-made jigs used for accuracy with repeat work. This high level of efficiency has built up over years of repeatedly making similar components, and everybody knows exactly what they're doing, which means that despite their small number, Triplegrove have the experience and skills to punch above their weight and produce both quality and quantity that many companies two or three times their size would envy. 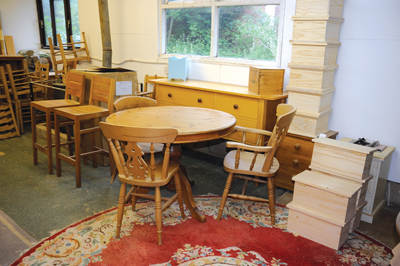 The company employs one part-time member of staff to assemble furniture, and since starting she has added drilling components and even spindle moulding to her skillset, adding further efficiency to the well-oiled machine that is Triplegrove - even the offcuts and sawdust are put to good use in the woodburner to keep the shop warm in the winter. 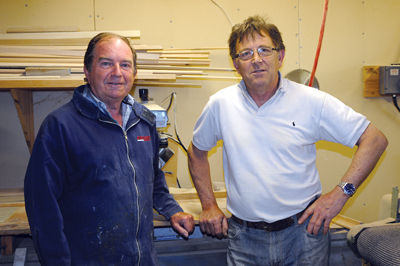 Mike and Graham started Triplegrove as experienced engineers with an interest in cabinetmaking. "I grew up in London and did an engineering apprenticeship," says Mike. 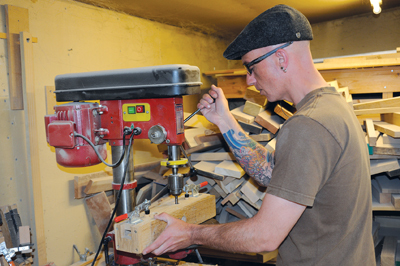 "I thought about working in cabinetmaking but the nearest place I could find the work was in Birmingham, so I worked as a maintenance and tool building engineer instead." 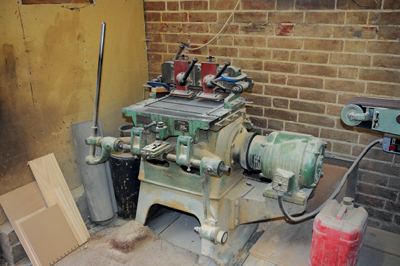 When Triplegrove was founded, Mike and Graham incorporated their engineering skills, running a sort of five-pronged business: "We used to do engineering, kitchens, bespoke work, painted furniture and a trade side. We'd never let any part take up more than 20% of the business, so nothing was holding the rest up." Making kitchens from scratch began to be too time-consuming, so Triplegrove started to buy in the kitchens to fit for the customers, and gradually the engineering side dropped off as the furniture work increased - by keeping each aspect at 20% at first, they allowed the business to naturally become what it is today. But it hasn't been a completely smooth ride; their original premises, half of a working sawmill on the Knepp Castle Estate, was destroyed by fire 15 years ago. Triplegrove had to make a fresh start after that, but wore the hard times well and have gradually added to their premises since then. It was fortunate that the company had already been running for some 10 years before the fire: "We had to get all new equipment, but because we'd had the business for a while and knew what worked best for us, it did mean we knew exactly what we needed and what we didn't," says Mike. 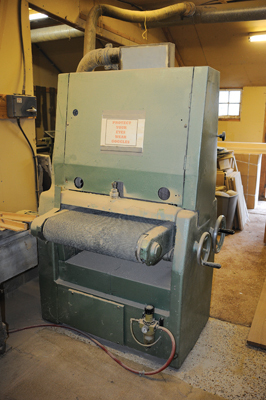 One of the most important machines is a 1953 Brookman dovetailer, which makes it possible for the small workforce to create high-quality joints in large runs. "We buy in kiln-dried, sawn-through hardwood, and we get good use out of waney-edge stuff because you can use the offcuts!" Triplegrove use Wenban-Smith Timber Merchant - who you may remember from 'My Working Day' in issue 83 of Woodworking Plans & Projects - for their laminated oak (Quercus robur), poplar (Populus spp. ), parcels of redwood (Pinus sylvestris) and radiata pine (Pinus radiate). "They're very good. We can get any amount from them we like - they'll deliver five parcels if we want them. We get the radiata pine for its stability and lack of knots." Triplegrove's stock also includes maple (Acer campestre), cherry (Prunus avium) and black walnut (Juglans nigra). Tellingly, Triplegrove doesn't spend a penny on advertising, but still regularly receives private commissions. "We've got the roadside sign and that's it. I think word of mouth is better."